Pogo Addiction Solitaire HD a Possibility? You are here: Home / games / pogo addiction solitaire / Pogo Addiction Solitaire HD a Possibility? 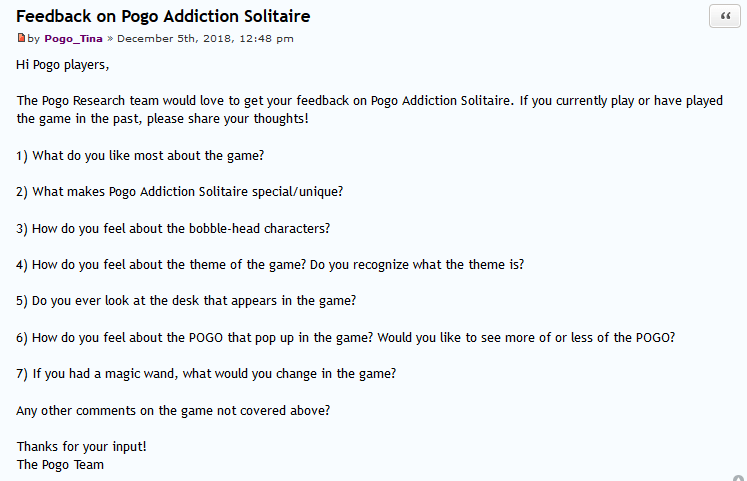 From the nature of questions, it’s looking like the Pogo team may be taking a close look at Pogo Addiction Solitaire as a possibility for upgrade to HD in the future. What do you think? Let us know in a comment below. Although I still need to rank out of Pogo Addiction I still love this game. I love the challenge of getting the entire bonus game completed to get the 4,000 tokens. Yes, the bobbleheads need some updating but hey a cool sol game and among my favorites when it comes to card games. Plz upgrade this game. Yes, please don’t wreck it. Great game. I kinda like the game and yes it can be addictive but not for me. I don’t like that is hard to win even using power ups and shuffles. For me having to play and play just to win one hand gets boring and discouraging and I just stop playing the game. Fine by me if they make this game HD but I rather have other games made HTML, like Squelchies or Woderland Memories and many others. If they don’t change it to HD, it’ll be gone forever when Java goes!! I say HD rather than lose it forever. Addiction is one of my favorite games. I probably win half of the games or more, so the losses don’t bother me; and at least, it has the power-ups and shuffles and unlimited undo’s to help. Quinn’s is so disliked because each and every move has to be perfect in order to win the very long game; and there are no undo’s, power-ups, or anything available without paying for everything. I like pogo addiction solitaire but any game without tokens is a pass for me at this point. I enjoy the game though in one sense it makes me sad. I see the characters from Penguin Blocks, Poppa Zoppa, and all the other old games and remember when Pogo was an opportunity to just play fun games rather than feeling nickeled and dimed all the time to get power-ups. I’m so sick of games that constantly want me to spend gems. Hey, Pogo! I’m already spending money just to be a member. I loved the game before and ranked out in it and made lots of friends and had lots of good times in there BUT>………………………………………………….. the way the chat is set up with this new format I dont see that happening again . You can not play the game and chat at the same time and keep up with both. Cant something be done to put the chat on the side of the game? I agree with the chat aspect. I love Pogo Addiction Solitaire and ranked out in it a long time ago. The chat was always a big part of it. Chat helps with fun and morale of the game. It is like several other games like Hog Heaven Slots, which players cheer each on as they play. I would play the HD game, but if power-ups were added and required to pass the ranks, I would not play it. I like all of the bobbleheads. It was one of the games where we won mini items as we ranked up. I wish Pogo would bring back that feature. I was playing this game just to get the Rank 20 badge which I got last night, yay. I love this game, but am only playing the Java games to get to the next rank badges before the Java games are gone. My vote is for an HD upgrade. POGO might be the pop up bonus round that Kathy refers to above. Since there wouldn’t be any tokens in the HD version, the bonus round would have to give out Pogo’s new and exciting token replacement whatever. I like the bobbleheads and the desk with the clickable items (it took me a while before I found out you could that). Oh YES, please. I liked this game. and Dice City Rollers it’s of my fav’s.I will be very happy if they can do these too. Oh, and Thousand Island Solitaire too. I’ll miss the tokens like everyone else but this is a great solitaire game and I really like it so I’m hoping Pogo will save it and make it an HD game. I like the mini game that’s in it and collecting the bobbleheads that help you get into the mini game (mini meaning the pyramid). The game play is great too and getting to choose who to give a gift as opposed to random giving as in Mahjong Safari. We haven’t seen too many Java games get made into HD so far, just Lottso Express and I wish Pogo would concentrate more on Java games as almost no browser supports Java anymore. I’m so glad this question was asked. The more “oldies but goodies” they resurrect from the old Java days, the happier I’ll be. I’m hoping that the more experience their programmers get at converting old Java games to HTML, the better chance that the number of conversions will go up. Whoever designed those older Java games was a genius–it would be a shame to lose that, plus there’s no licensing fees to worry about. I’m purely guessing that they are probably taking a closer look at games that can be easily translated to a mobile interface. I used to dread playing Stack’em challenges, but playing on my iPad while laying down in bed, made it so I couldn’t put it down! I think that’s why there’s been such a heavy emphasis lately on HOGs. Producing new content for HOGs is fast and easy, and tides us over until they build a bigger stable of HTML games. I would LOVE Addiction Solitaire added to the HD games. And Thousand Island, Dice City Roller, KenoPop, Lost Temple Poker, and Panda Pai Gow, too….old games I ranked out a long time ago and would love to play again. Agree with Faith, I can think of a few more java games I would love to see resurrected. Yes, PAS is one of my all time favorites. I like the bobbleheads for a walk down “Pogo” memory lane. Yes! can’t wait to see this! As for the bonus game, doesn’t make much sense without tokens. But then, I don’t like bonus games, period, as a rule. FYI, P_Tina has edited her post – “POGO” was replaced with “mini games”. Have NO idea why that would be filtered. I never really got into the game too much but everything about the game is A Okay ..The only issue I have with the new HD format is chat.. with chat being under the game its very hard to chat and play at the same time..I am not much of a chatter but at times when I do include myself in conversation I don’t seem to stop chatting..LOL..As far as passing gifts in Pogo addiction , Mahjong Safari , etc How or will that change in the new HD format ? I ranked out 3 or 4 years ago, and still play it. I would have much rather they had converted Pogo Addiction rather than Lottso Express, I despise that game.. Yes, Pogo, do it, it will be fun. For all of you still working on ranks in this game: There is a way to rank quickly rather than playing out the entire game. If you solely focus on just collecting the gold cards, you will rank up a lot quicker than if you play the game through, since ranking up is based on how many bobbleheads you collect. I would like jungle gin, canasta, and not lose these games. Yes, I like the game but Pogo you must bring back the tokens. I LOVE Pogo Addiction Solitaire. I’m not ranked out (in anything!) but I would dearly love to have Pogo Addiction Solitaire converted to HD. And also Thousand Island Solitaire!! Like this game a LOT. The unique aspect of this game is the unlimited “undo” button. You can try a zillion different ways to clear more cards from the board before the necessity of using a power up. Solitaire games are my favorite. Would also like to see Perfect Pair Solitaire brought to HD. make it to top of the volcano with out finding the fire that blows it up. Love the game! Please include it! Ranked out in it eons ago and would like to have it included, I like all aspects of the game. Love This Game, I really hope Pogo will add it. I love Addiction. Converting it to HD will be good because of most browsers not using Java anymore, but when they update the graphics, it’s likely they will change all the bobbleheads to characters in the newer games. So I’m afraid that we will lose all of the Java-based characters that are currently in the bonus game and that will be very sad. I would MUCH prefer to play Addiction Solitaire over all the dang Quinns Aquarium.. They’ve gone overboard on all the daily and weekly challenges for that awful game.